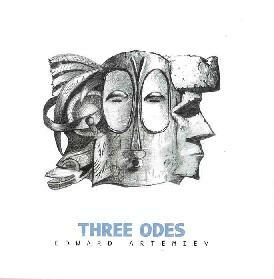 Edward Artemiev - "Three Odes"
The latest from Russian composer and electronic maestro Edward Artemiev is a collection of past works composed for specific events and now compiled for our listening pleasure. The 7-part Ode #1 was recorded in 1980 for the Moscow Olympic Games and was used during the opening and closing ceremonies. Things kick off with the most rockin stuff I've heard from Edward yet. His majestic symphonics are given a turbo boost by blazing rock and a bit of Ozric Tentacles styled bubbling synths, which is interesting because this would have pre-dated the Ozrics by a few years. Next the music shifts to a corny variety show theme sound (after all it is for an Olympics ceremony), but there's also prog rock influences and close listening reveals lots of excellent and often freaky keyboard and synth bits. The next part features a mucho spacey combination of the Ozrics and Tangerine Dream along with beautiful choral embellishment (the Russian State and Moscow State Choirs contributed) make for an overall regal space-prog sound. We're also treated to bits of ELP and I love the full choir which makes for full symphonic progressive in all it's bombastic glory. The closing ceremonies portion is once again back in standard TV theme territory though it still manages to retain its grand sound. Ode #2 was recorded for the 1990 film "Urga - Territory Of Love", which Edward did the score for though this piece was ultimately not used. The music is intense and dramatic with multiple keyboard and percussion patterns and adorned with Oriental chanting. Ode #3 was recorded in 1997 for the opening ceremony of the "Teffi" prize (Russian nomination for best production in the TV industry), and is the only track on the album that didn't really grab me, being more of an semi-operatic pop piece. Overall, there lots on Three Odes that fans of keyboard driven progressive rock would love and space fans who also dig prog rock will find much to enjoy too. I'd pick this up for the Ode #1 alone which is some of the best work I've heard from Edward yet and makes up the bulk of the album anyway.